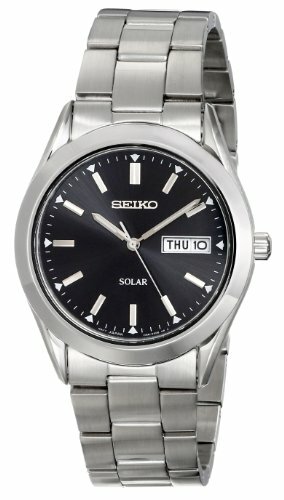 Demonstrate your impeccable taste and competency by wearing a Seiko Solar Calendar Watch. There’s no need for battery changes with this energy efficient men’s timepiece which is powered by all light and generates a long power reserve for reliability. Crafted of brushed stainless steel with a white dial protected by a durable crystal, it’s a polished bracelet watch for every day.